The 2019 FIRST Robotics Regional Competitions are finally upon us! Are you ready? Check out our compilation of webcasts in the link below! Webcasts will be linked as they become available. The 2019 FIRST Robotics Competition kickoff marks the beginning of the design and build season for the FIRST Robotics Competition. Teams have the opportunity to meet at "local" Kickoffs to compare notes, get ideas, make friends, find mentoring teams, learn the game, pick up the Kit of Parts, and get geared up for the exciting competition season. The 2019 Kickoff took place on Saturday January 5th, 2019. FIRST VR Page - Has other options if the above don't meet your requirements. The highly anticipated moment that all FIRST Robotics Competition (FRC) teams that submitted an application for a NASA FRC grant, has finally arrived! NASA's award selection is listed in the following link. If your FRC team submitted an application for a NASA FRC registration grant, please review the awards list to verify your award status. For those teams that were awarded a registration grant please ensure you complete the requirements for the grant. 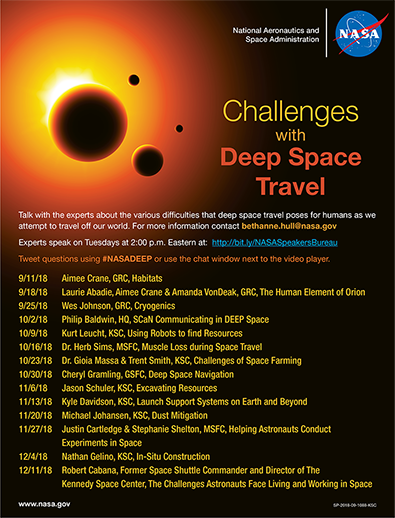 Experts at NASA will be doing online talks about the various challenges with Deep Space Travel! Each Tuesday will have a new topic and the ability to ask questions to the expert via Twitter with the #NASADEEP hashtag and through the video players chat window. Want to build your own six wheeled rover like the ones on Mars? 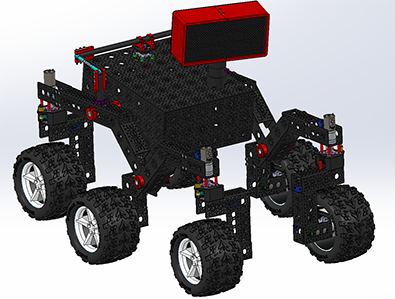 NASA's Jet Propulsion Laboratory created the "Open Source Rover Project" which provides the plans for anyone to build a rover. This rover is quite capable thanks to the rocker-bogie design with differential pivot and six wheeled Ackerman steering! 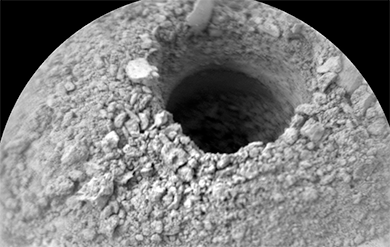 During Sol 2138-2140 The Mars Curisosity successfully drilled a hole within the Pettegrove Point Member on the Vera Rubin Ridge. For now the team will focus on obersvations of the material to determine if it can be sent to the analytical instruments for further investigation. Since June 10, 2018 NASA's Mars Exploration Rover Opportunity has been silent. The solar powered rover has been unable to receive enough energy due to a planet wide dust storm. Scientists think that the dust storm has already peaked and there is hope that the rover may be able to receive enough sunlight to power back up soon. 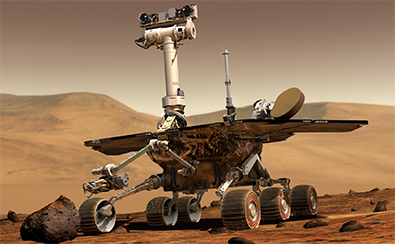 Engineers at NASA's Jet Propulsion Laboratory are now trying to recover the rover. Follow the Robotics Alliance Project on Twitter! We use twitter to post about announcements, new features, and much more! Robotics online course: Watch the archive! Download: Saturn and Mars screen savers! Can't find a front page feature? Try the Features Archive.